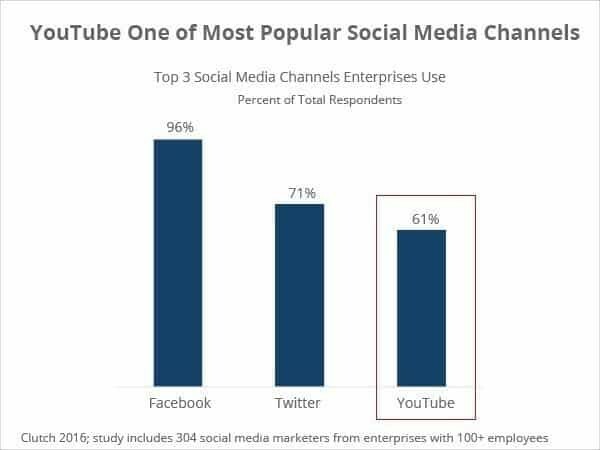 When it comes to social media, enterprise companies in the US identify Facebook (96%), Twitter (71%), and YouTube (61%), as their top three platforms, according to a new survey by Clutch, a leading B2B research firm. YouTube’s impressive ranking as one of the most popular social media platforms among enterprises, validates the increasing importance of video for social media marketing. While some marketing professionals express surprise that enterprises prioritize YouTube over other big-name social media channels like LinkedIn, others point out that YouTube is a unique medium for businesses seeking to improve their search engine optimization (SEO) and enhance their content strategy. The overwhelming support for YouTube in the enterprise market emphasizes the increasing importance of video for social media marketing. Video outperforms images, offers and promotions, and articles as the content that yields the best results on social media. 22 percent of social media marketers surveyed point to video as the most effective content medium. “You can tell stories in a different way through video. Video can portray what a picture can’t fully communicate,” said Keith Kakadia, Owner of SociallyIn, a social media marketing agency. Clutch’s first social media marketing survey also addresses the top three benefits and challenges of social media use. Enterprises typically use social media to increase website traffic, enhance their brand image, and target their audience and influencers, according to Clutch’s study. But, they also indicate that they struggle to develop a robust social media strategy, track results, and keep up with platform changes. The report also identifies several ways that enterprises can use social media to their advantage, including investing in social media advertising, monitoring social channels, responding to customers, and learning how to use targeting features to reach the appropriate audiences. Clutch’s 2016 social media marketing survey included 304 social media marketers from enterprises with 100+ employees. 62% of companies consisted of more than 500 employees, with 71% working at B2C companies and 29% working at B2B companies. The full report can be found at https://clutch.co/social-media#survey.